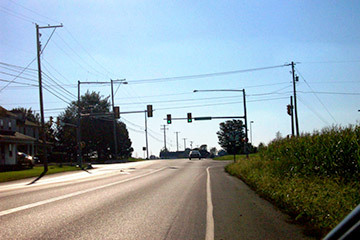 Hanover Engineering was retained by Rapho Township to design improvements and provide safety upgrades to the rural intersection of PA Route 772 and Esbenshade Road. The original intersection consisted of four single-lane approaches and was characterized by a higher than expected vehicular accident rate, as well as storm drainage problems. Proposed industrial development in the vicinity of the intersection dictated the need for intersection improvements, including eastbound and westbound exclusive left-turn lanes, a revised intersection geometry to accommodate increased truck turning movements, and traffic signalization. Due to design constraints, it was necessary to move the roadway closer to the residential dwellings along the south side of the intersection. As a result, truck barrier curbing was designed and constructed as an added measure of protection for these dwellings and their occupants. Also, an innovative storm drainage design was required due to the area’s flat topography. The design was approved through close coordination with PennDOT.